Dry ice cleaning is the preferred method for environmental cleaning and surface preparation across an increasing number of industries. 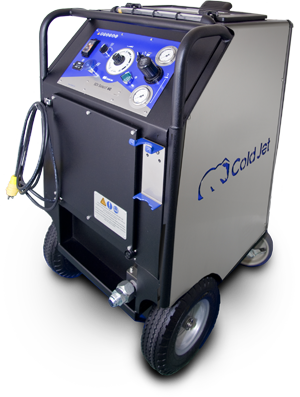 Cold Jet remains ahead of the curve with the SDI Select™ 60, a dry ice cleaning system that offers the value of delicate cleaning and high-level aggression all in one frame. Designed with application variability and ever-changing industry demands in mind, the SDI Select 60™ can navigate the dry ice cleaning spectrum with ease. Showcasing Cold Jet's patented shaved dry ice technology, the SDI Select™ 60 can clean large surfaces of thin, hard contaminant, without damaging the substrate. When faced with heavier contaminants, simply bypass the shaving media, turn up the aggression and clean using full 3mm blasting pellets. Bond cable collar, silicone; 1"